Except for a few bright spots in Germany, the US, and China, the overall picture remains one of stagnant or contracting growth and corporate earnings. See here for details. See below for highlighted scheduled economic reports this week. It’s a busy week, including multiple central bank rate statements, a batch of China data, and US monthly jobs reports. These are the two TBTF EZ nations that are most at the most solvency risk and therefore most in need of political stability. Spain’s relatively EU/market friendly administration is at risk from a growing corruption scandal. Italy’s recent election produced a deadlock from which it’s unlikely that the result will be a market friendly coalition that is willing to continue economic reforms (aka politically unpopular austerity). Rather, the anticipated result is a temporary coalition that survives just long enough to call a new election after it changes the election laws to produce a more stable outcome. Meanwhile remember that 57% of voters backed abandoning current EU favored austerity programs and thus, given the EU’s current position, rejected remaining in the EU under current conditions. More on this in our recent posts here and here. Congress’s penchant for last minute deals to prevent damage to the US economy and, thus, (of greater concern to these elected policymakers), their chances for re-election. Even if it takes effect, most believe Congress will get a deal done to avoid a potential 0.5% cut to GDP if the cuts remain throughout 2013. The actual spending cuts for this year are only part of the total at risk, so the numbers are not huge. None of the 800,000 potentially furloughed federal employees loses any pay until April, because they get 30 days paid notice of (temporary?) dismissal. Using the S&P 500 weekly chart as our gauge of medium term global risk appetite, three things stand out. The index has been flat for 3 straight weeks. The last two times we had multi-week tight, flat trading ranges following extended uptrends (March-April, September-October 2012), the index and most other risk assets pulled back. By the way, both periods were times of heightened EU worry, as we have today from political instability in both Italy and Spain. The last two weekly candles are doji shapes, implying indecision that often proceeds reversal after an extended strong uptrend like the one we’ve seen since the start of 2013. As we’ve mentioned repeatedly in recent weeks (for example here) with so many stock indexes near decade-old resistance, and an utter absence of the conventional indicators of growth that typically are the only justification for yet higher prices, risk assets remain vulnerable to bad news. Stimulus has been the fuel to get markets this far, but we’ve yet to see if it will be enough to inflate prices to sustainable new all time highs. 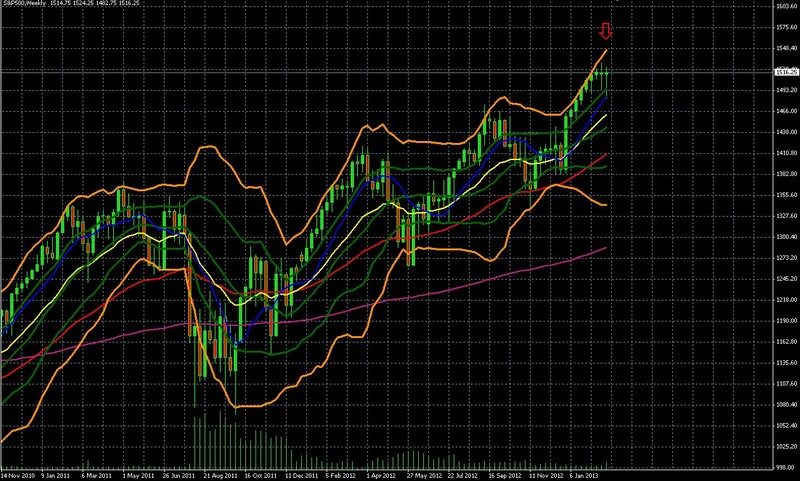 Double Bollinger Bands: Price remains safely within the Double Bollinger band buy zone (top quadrant) which typically is a signal that upward momentum is strong enough to continue and justify new long positions. See here for rules of interpreting Double Bollinger Bands. Of course, one should never make trading decisions based on just one technical indicator. Those interested in the full details can either search more about moving averages as momentum indicators, or consult chapter 8 of my book, The Sensible Guide To Forex, for a full explanation of moving average crossovers. Much of this can be viewed for free online via the “Look Inside” feature on the book’s amazon page here. Soon there will be a second free online course being offered based on the book, in addition to the one currently given by Caesartrade.com, in which you can learn more about this topic if you prefer the video format. There are no conventional fundamentals to support such a move at this time, however there is one huge unconventional fuel for risk asset demand – the ongoing and likely growing coordinated global stimulus. The Fed is already pumping $85 bln/month into markets, Japan is committed to starting soon, and both the UK and EU appear likely to introduce new forms of their own QE in the coming months, as do other nations like Australia. Here are other fundamentals that could be bullish or bearish. These normally potent market movers have been overshadowed in recent months. However a strong bullish or bearish surprise can be significant, because jobs and spending remain the two metrics that are most influential on Fed policy. A very bullish result that beats the consensus 158K figure by over 15% would revive speculation that the Fed might unwind its QE 3 sooner. That would boost the USD without doubt, as QE is considered dilutive for the USD. The affect in stocks is less obvious. On the one hand more employment should be good for growth and earnings. On the other, if markets believe that in fact stimulus might now end sooner, they could actually fall. The ideal result for risk assets would be to see improvement, but not enough to change belief in continued QE 3. Before the Friday BLS release of these reports, the related data releases that hint at the final actual figures, (ADP’s NFP report, ISM non-manufacturing PMI report, etc) could also move markets. As we discuss in greater depth here, there’s a range of factors pressuring the ECB to take some tangible new QE measures of its own (OMT remains purely theoretical because the conditions nations must meet to get the aid have thus far scared off those who may need it, making the OMT thus far a purely verbal intervention). To move markets the ECB need not even do anything, it need only suggest that it’s moving closer to further easing. If recent history is any guide, that alone would suffice to boost stocks and other risk assets and further lower the EURUSD and other EUR pairs. The Germans may not like it but given the contraction in the rest of the EU they’re unlikely to offer any serious resistance. This might provide some market moving headlines Monday, though we doubt it. These are influential only if they surprise and only for their own currency pairs and stock markets. There will be rate statements from the central banks of Australia (Tuesday), Canada (Wednesday), Japan and UK (Thursday, though the ECB’s that day is the likely more market moving event), which is rarely a surprise, although the press conference could move markets if it says anything that feeds or dampens anticipation of radical new easing ahead. 11. Australia: building approvals, retail sales and the RBA’s latest rate statement, and GDP can be influential for the AUD currency pairs if there are any notable surprises. 12. China: There’s a batch of China data out on Friday and Saturday, including trade balance, CPI, PPI, and a host of second tier data that will provide the latest updates on the world’s top growth engine. 13. EU: Both France and Spain have key auctions of benchmark 10 year notes. As these are longer term notes not under the protection of LTRO, they better reflect confidence in these nations, and because of importance every effort is made to insure demand is good, so these tend to be bullish. We tend not to know until much later if there was real demand of if most of the purchases were from parties interested in keeping up appearances. For example, Spain bond used virtually all funds in its social security fund for bond purchases for 2012. That may not be the most prudent use of pensioner funds, however it should certainly cut spending on medications for low blood pressure and constipation, which are so often needed by said pensioners. 14. UK: Services and Construction PMIs, a speech by Gov. King, and the BOE’s rate statement may influence GBP currency pairs. Market risk: There’s far too much focus on why individual risk assets like stocks are a good buy, without sufficient warnings that these will fall along with markets in times of pullbacks. The EU remains the primary source of that risk, although the sequester issue risks becoming influential if it drags on unresolved until April, when up to 800k federal employees get cut. Beware currency risk: Just like you diversify by sector and asset class, you need to diversify your currency exposure, especially if most of you assets are linked to the USD, JPY, EUR, GBP or other currency at risk of being devalued faster than most others. As noted above, it’s just a matter of time before Japan moves from verbal to actual money printing, and similar moves are likely in some form from the ECB and BoE. In other words, all 4 of the most widely traded currencies are either being debased or at risk of devaluation. This isn’t mere speculation. For example, those in USD have suffered a steady wealth drain for decades. See here for further details on how the USD had been steadily shrinking long BEFORE we started with QE 1-3. This book also just won Best Forex Book Award for 2013, largely because it shows conservative traders or passive income investors how to protect themselves in safer, simpler ways than typically found in guides on currency or foreign investing. See here for details.